Material : H.S.S BI-metal +16+152 This kind of metal Hole Saw can be used to machining various metal including cast iron, forgeable cast iron, stainless steel , structure steel, aluminium for alloying , bronze, copper, PVC (Polyvinylchlorin) Crylic aid plastic, and wood, etc. Short on time? Let saw-blade sellers contact you. Shanghai Roblion Diamond Tools Manufactury Co., Ltd.
Shijiazhuang Xinda Diamond Tools Co., Ltd.
Pan Gulf Technologies Pvt. Ltd.
Ppan gulf technologies pvt. Ltd., offer an extensive series of highly reputed german band sawing products - manually operated saws and fully automatic, high performance sawing equipments to complete sawing centers with material handling systems. We offer: Complete range of bandsaw machines. 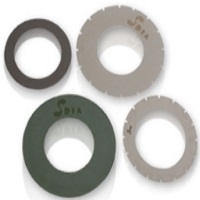 Hss bi-metal, carbide tipped and diamond coated bandsaw blades. Complete bandsaw line with robotic arms & material handling systems. Automatic in-feed & out-feed systems. We are attaching the product catalogue for your ready reference. Apart from this to improve your metal cutting business with higher productivity we provide: Consultancy for bandsaw machine and bandsaw blade applications including logistic systems for material transport Service support for band saw machines, annual maintenance contracts for your existing machines Health check / diagnostics for band saw machines for productivity improvement. Xiamen Murat Imp & Exp Co., Ltd.